Homemade Chicken Stock is easy to make at home with these step by step instructions on how to make homemade chicken stock on the stove or in the Slow Cooker. 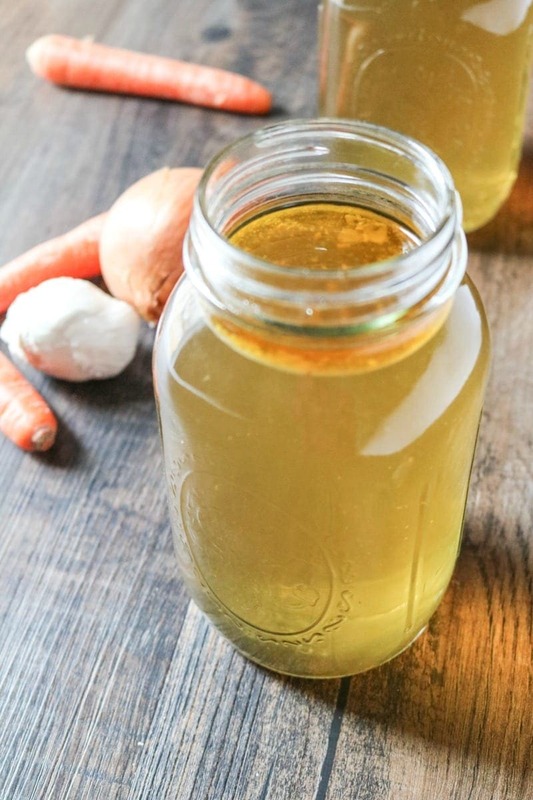 This rich chicken stock is made with chicken bones, herbs, and vegetables scraps for a tasty broth that is healthier and richer than store bought chicken broth. I am about to CHANGE YOUR LIFE with my recipe for Chicken Stock. Okay, maybe not CHANGE your life, but I am going to save you money AND make your recipes taste better with my homemade chicken stock. You are about to learn how to make homemade chicken stock with kitchen scraps. YES–things you would normally throw away! Making chicken stock takes hardly any hand on time at all and uses ingredients you already have. Not to mention YOU get to control the quality of ingredients and level of sodium in this chicken stock recipe. PLEASE stop wasting your money and make your own chicken stock. Trust me, I have not gone off the deep end with this one, the very things the majority of people toss into the trash, is all you need for a rich and flavorful stock. When I am talking about kitchen scraps, I am referring to vegetable peels, herbs that have lost their vibrant color, or vegetables that you will not be using. Get a gallon size bag that is freezer safe. Every time you chop an onion, peel a carrot, or chop celery place the scraps and skins in this freezer bag. 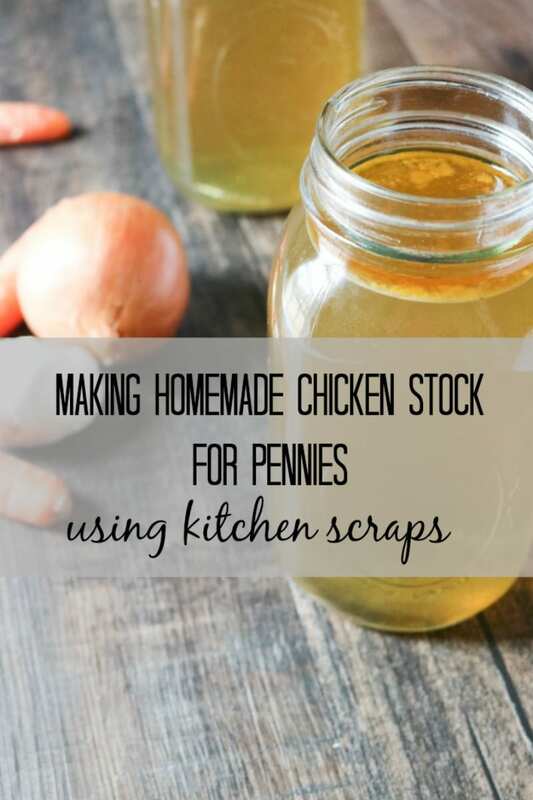 Just add to it as you collect more scraps and store in the freezer. Chopping herbs? Toss the ends or wilted pieces into your scrap bag. Dicing veggie for a vegetable platter? Toss in the ends of the veggies. Once you have roasted chicken with bones, be it a whole chicken or bone-in chicken breasts or bone-in chicken thighs, you are ready make chicken stock. Place all your scraps and bones into the pan of your choice. You can see that for this batch of stock, I had carrot peels, onion peels, pepper pits, bay leaves, bones and rosemary to make this stock. Add 3-4 tablespoons kosher salt and 1 tablespoon pepper. I like to toss in a bay leaf or two as well. Bring to a boil. Reduce heat to simmer and allow to cook for at least 3 hours or longer. Cool the broth and store in the fridge overnight. Store in 2-4 cup freezer safe containers or glass jars. PRO-TIP: I like to use my large 8 quart pan with a colander/steamer insert, which makes straining out the solids extremely easy. 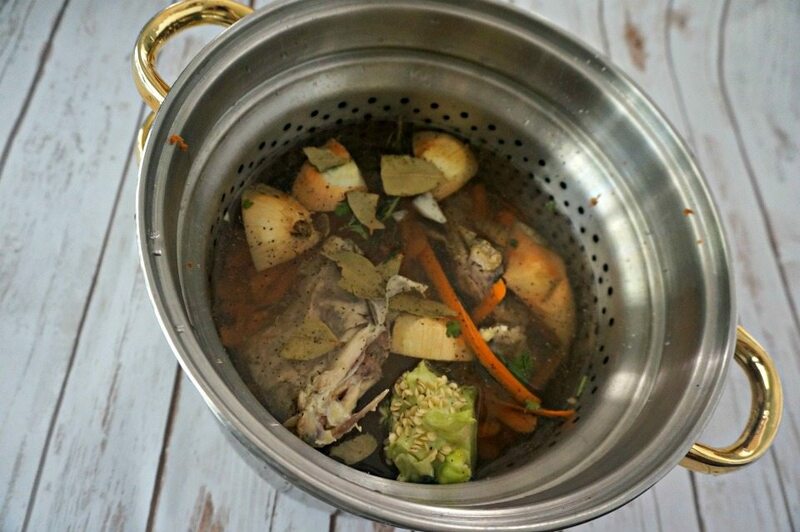 Place all your scraps and bones into the crock pot. PRO-TIP: A time saving hack, is to let your chicken stock cook overnight in the slow cooker. Once the stock has cooled completely, measure out the chicken stock into several 2 and/or 4 cup containers. Chicken Stock will last 5 days in refrigerator and 3 months in freezer. Once stock has cooled completely, pour chicken stock into freezer safe quart size bags or 4 cup freezer safe containers. Be careful to not over-fill your bags/containers as liquids expand when frozen. Store in freezer for up to 3 months for best flavor. Defrost chicken stock in fridge overnight, or speed up defrosting, by placing frozen container of chicken stock into a bowl of cold water in the fridge. Chicken Stock is made with the BONES or the chicken. Chicken Broth is made with the MEAT of the chicken. Chicken Stock is RICHER than chicken stock. A rich and flavorful homemade chicken stock is made with chicken bones and vegetable scraps. Can be made in slow cooker or on stove top. Place vegetable and herb scraps and bones into the pan of your choice. Add 3-4 tablespoons kosher salt and 1 tablespoon pepper. Add in bay if desired. Bring chicken stock to a boil. Reduce heat to simmer and allow stock to cook for at least 3 hours or longer. Place bones, scraps and seasonings into slow cooker and cover with water. Strain out solid and cool stock for 20-30 minutes before storing in 2-4 cup containers in fridge or freezer. Use the bones from 1 whole chicken or 2-3 large chicken breasts or 5-6 chicken thighs. Chicken wing bones and chicken leg bones can be used as well. Use any vegetable scraps you like for this Homemade Stock. I recommend carrot and onion peels, celery leaves, and rosemary, thyme and parsley. That’s exactly how I make my chicken stock. I save all my bones and kitchen scraps in the freezer and simmer. I do simmer for a longer time though- if you let it simmer even longer you get more gelatin out of the bones, which is super good for you. I usually do 24 hours in the crockpot or 12 hours on the stove. Yes, the longer you can simmer the better. Yes! This is exactly what I need to start doing and freezing in 2 or 4 cup containers! This will definitely help me cook healthier and cheaper soon. I love cooking things in broth and too often end up just using bullion. Also, thanks for coming by the Retro Re-pin Party. This has been pinned to our party board. Cheaper and Healthier, can’t beat that! LOVE this! Not something I would instinctively know how to do that’s for sure! I love how you showed what you actually used. It makes me more comfortable to use scraps if I know (and can actually see) someone else doing it. I will definitely be giving this a try soon! I love homemade chicken stock and this recipe looks very good. Hope you are having a great day and thanks so much for sharing your awesome post with Full Plate Thursday. Thank you so much for sharing your versatile homemade chicken soup recipe with us at the Healthy, Happy, Green and Natural Party Blog Hop. I appreciate it! I just pinned this to use in the future. I want to start making my own soup stock. Thanks Linda!! You will be so amazed at how much money it saves you! What is your favorite brand/type of freezer container split or degrade with use? I love Ziploc freezer containers–they work well and they are inexpensive when they go on sale. I also will use freezer bags (any brand) to save space at time as well. Hi Mike, there is no need to first cook the chicken for safety reasons, as you cook the chicken stock for long enough to kill salmonella. I use bones from pre-cooked chicken for convenience (because I am already baking/cooking chicken) and I will say roasted bones do add more flavor to your stock. Can I use the bones from a Rotisserie Chicken I picked up at Sams? Hi Mary! You can use any chicken bones you like. The only thing I caution when using a store-bought rotisserie chicken is that if you have a lot of meat left, you may need to decrease the overall salt content, as they tend to be really high in salt. Enjoy!! Totally life changing!! This needs to be in my fridge at all times- thank you for all the great tips! Oh you are so welcome Sues! Enjoy! This is perfect for all of my soup making needs! I will be using this a lot this fall and winter! YAY!!! I always have some on hand and my soups are tastier for it! What do you do with the bones and scraps afterward? All my scraps would usually go into the compost, but now they’re contaminated with meat oils. I’d hate to just throw them out! Hi Kassie, for these vegetable scraps, I would probably throw away–or I do know some people place in bokashi bin that is safe for meat, fish and dairy. It’s a closed bin so it doesn’t smell and after about 2 weeks the bin contents can be mixed in on your compost heap. But I do not have experience with these. I make stock and broth often; and while I was aware of the possibility to use my vegetable scraps, I was hesitant. Many volunteer hands at my church and a start up commercial business was where I learned about this method. After seeing your post, I decided to save my scraps and give it a go! My biggest concern was the dirt that’s in the crevices of the onion ends, celery ends, etc. But I gave this a try, buying cheese cloth to help with the straining of fine particles at the end of the stock. Now mine tastes as good as the start up chef’s, and I am thrilled! Thanks so much for just discussing this. I’m saving, and I’m making. I have been making broths from the leftover vegetables when I buy in bulk and don’t use them all before they start going bad. Does anyone do anything with those solids leftover from the broth process? I realize much of the flavor etc will have leached into the broth but there’s got to be some use for them. A purée for thickening maybe?